Religion: manifestly non-religious; future: Evangelical "born-again Christian"
First Appearance: Iron Fist (vol. 1) #14 (Aug. 1977): "Snowfire"
Battletide #1 (Dec. 1992): "Battle Tide Part 1"
Battletide #2 (Jan. 1993): "Battle Tide Part 2"
Battletide #3 (Feb. 1993): "Battle Tide Part 3"
Battletide #4 (Mar. 1993): "Battle Tide Part 4"
Daredevil (vol. 1) #238 (Jan. 1987): "It Comes with the Claws"
Daredevil Annual #5 (Sep. 1989): "Super Senses Comparisons"
Identity Disc #1 (Aug. 2004): "Identity Disc, Part 1"
Identity Disc #2 (Sep. 2004): "Identity Disc, Part 2"
Identity Disc #3 (Oct. 2004): "Identity Disc, Part 3"
Marvel Fanfare (vol. 2) #6 (Feb. 1997): "Second Chances"
New X-Men (vol. 1) #142 (Aug. 2003): "Brimstone & Whiskey"
Weapon X (vol. 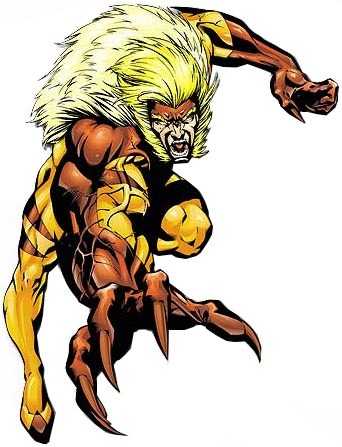 2) #4 (Feb. 2003): "The Hunt for Sabretooth, Conclusion"
Weapon X (vol. 2) #6 (Apr. 2003): "The Underground: Prelude"
Weapon X: The Draft - Agent Zero #1 (Oct. 2002): "Initiation"
Wolverine (vol. 2) #41 (Early July 1991): "Down in the Bottoms"
Wolverine (vol. 2) #45 (Early Sep. 1991): "Claws Over Times Square!" Wolverine (vol. 2) #46 (Late Sep. 1991): "Home is the Hunter..."
X-Factor (vol. 1) #119 (Feb. 1996): "The Best Offense"
X-Factor (vol. 1) #120 (Mar. 1996): "Meeting the Maker"
X-Factor (vol. 1) #121 (Apr. 1996): "The True Path"
X-Factor (vol. 1) #122 (May 1996): "The Faces of Truth"
X-Factor (vol. 1) #123 (June 1996): "It Begins... Again!" X-Factor (vol. 1) #125 (Aug. 1996): "Free Fall"
X-Factor (vol. 1) #127 (Oct. 1996): "Darker Destiny"
X-Factor (vol. 1) #128 (Nov. 1996): "Night of the Hounds"
X-Factor (vol. 1) #130 (Jan. 1997): "A Mother's Eyes"
X-Men (vol. 2) #36 (Sep. 1994): "The Phalanx Covenant, Book One - Generation Next, Part 2: Drop the Leash"
X-Men (vol. 2) #37 (Oct. 1994): "The Phalanx Covenant, Book One - Generation Next, Part 4: The Currents Shift"
X-Men (vol. 2) #191 (Nov. 2006): "Supernovas: Part 4"
X-Men (vol. 2) #196 (Apr. 2007): "Primary Infection: Part 3"